Getting its name for the Luganda word for ‘the feeling of a sudden uncontrollable urge to move, shake or dance’, the third edition of Nyege Nyege festival in Uganda descended upon the shores of the River Nile last weekend. An eclectic mix of curious locals in search of a party, East African hipsters and adventurous festival-heads from further afield were treated to a four-day party across four stages in the middle of a luscious green jungle. From German techno to Cameroonian Afro-pop, UK reggae to South African Gqom, the lineup was as diverse as the crowd. But the show was stolen by an impressive East African contingent, so we caught up with five artists from the region – and found out what gives them an uncontrollable urge to dance. Crowds turned out in force for Otim Alpha and Leo Palayeng’s high energy performance on Friday; a result of hype following Alpha’s first album release on label Nyege Nyege Tapes earlier this year. Hailing from Gulu, a city in Northern Uganda, Alpha was a boxing champion in his younger years before he started making music and performing at weddings – first on his own, and then in collaboration with his producer Palayeng. When he was growing up Alpha remembers seeing how “big guys” playing adungu (an arched harp instrument from Northern Uganda) lifted the spirits of people in his community, particularly during wartime: “They’d make big parties and I’d secretly follow them and watch how they played. I wanted to be like those guys.” Now aged 47, Alpha sings and plays adungu alongside Palayeng’s polyrhythmic beats to create “electro acholi”. Like all the artists on this list, DJ Rachael says high energy music is what she’s all about. Dubbed East Africa’s first female DJ, industry veteran Rachael recently celebrated 20 years in electronic music. Now 39, Rachael went from MCing at hip hop clubs in Kampala as a teenager to mixing and, more recently, producing the “afro-electronic and house fused with dubs and remixes and a touch of Latino house,” which she pumped through the Eternal Disco stage late Friday afternoon. DJ Rachael has also gained international attention for Femme Electronic, through which she trains and mentors other East African women interested in DJing. “All the other artists here. Everyone is playing what they love, that gives me the urge to dance. Their energy has been transferred to me through music”. Writer, arts organiser and DJ Kampire Bahana first got on the decks after getting involved in the first ever Nyege Nyege two years ago. 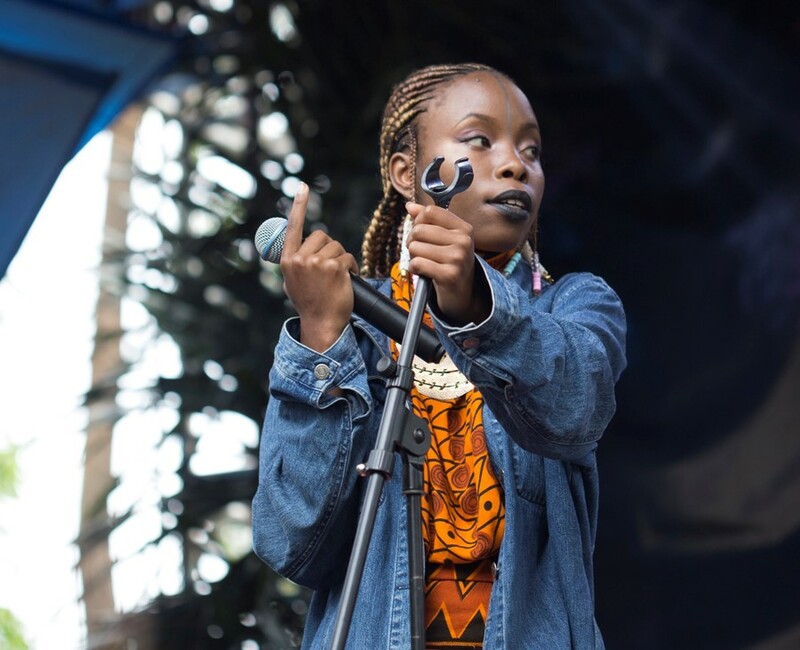 “It exposed me to this really cool community of independent artists in Uganda and also underground artists globally who are interested in the African continent,” says Kampire, who mixed bass heavy tunes, African polyrhythms and old school Lingala instrumentals during her two party starting sets at this year’s festival. Dissatisfied with the what the mainstream music scene in Tanzania had to offer young people, the guys behind Sisso Records got together to create a new electronic music genre: ‘Singeli’. An underground sound from the ghettos of Dar Es Salaam, back at the Nyege Nyege Tapes studio in Kampala, Yungkeyz Morento and Tampa Pana explain how their raw, frenetic sound is “a totally new thing, you won’t have heard stuff like it before. But we are inspired by Tanzanian music like Bongo Flava, Mnanda, Mchiriki… as well as house music from South Africa.” The Sisso Records crew took over the main stage on Saturday to perform their big sound for their biggest crowd yet: “It was a very happy weekend,” they finish.